It’s no secret that I love Halloween. I love everything about it. Free candy? Yes please! Dressing up in a crazy or fun costume? Count me in! Somehow I managed to pass on my love of the costumes and candy to my child. Sadly, while we were packing for the big move across the country we realized that almost all of the costumes he had and played dress up in were far too small. 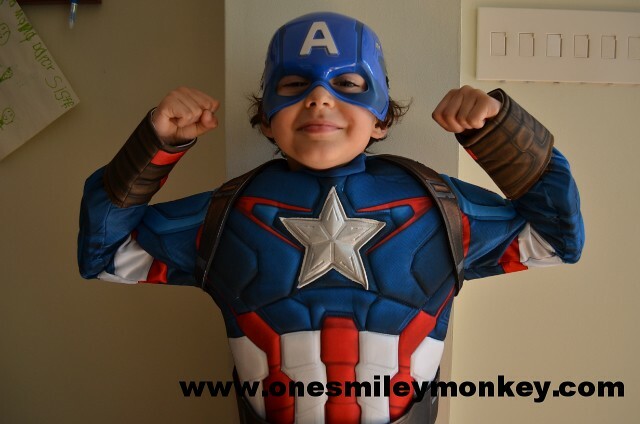 We were given the opportunity to test drive a new Avengers 2 – Age of Ultron costume and of course my child selected the epitome of goodness: Captain America. 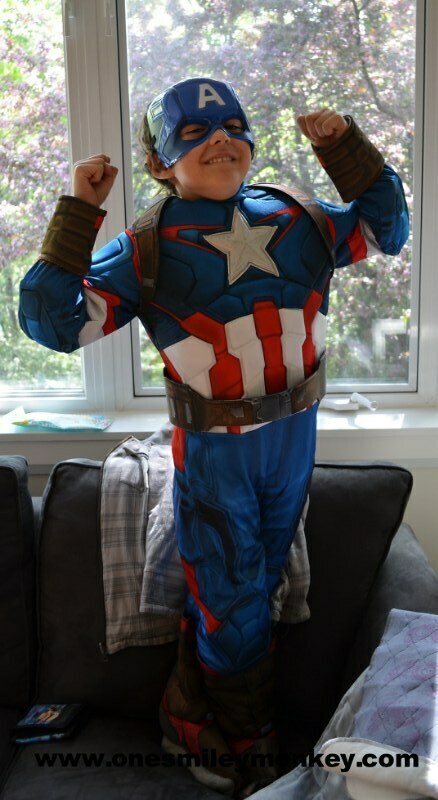 Upon arrival, D immediately ripped open the costume package and was thrilled to “be” Captain America. He refused to take it off for the rest of the day and was excited to FaceTime with his grandparents so that they could see it as well. I believe that little boys are hardwired to love superheroes. It seems genetic. The costume itself is much like most standard children’s costumes in that it is made of a thin polyester with some padding in the spots that resemble muscles or armour. A belt was included, but it was far too big for my incredibly thin child. Not a big surprise there though. The plastic head piece/mask had nice big holes for the eyes and it wasn’t constantly slipping off or bugging him to the point of him wanting to take it off. The only downside, and it is one that plagues every single costume of this type, is that the Velcro that does up the back snagged the fabric in various places as soon as he took it off. He was also devastated when he realized that the shield was not included in the package (it does say “sold separately” but that is small consolation for a 6 year old who can see the child on the front of the package proudly brandishing a shield). D is a very tall 6 year old (approximately 50 inches) and the size medium (8-10) fit him perfectly. With an MSRP of $39.99 USD the costume is reasonably priced and comparable with most branded products of its kind and can be purchased online from Buy Costumes. I think we now have our fall 2015 Halloween costume. I may get suckered into buying the shield of course ($14.99). But hey, it’s for Halloween after all, how could I say no? Great costume! Love the look on his face too! Haha omg he looks so cute! I hope my boys don’t see this post or both of them are gonna want this for halloween. His excitement is contagious! Looking fierce and proud! I really can’t wait to see this movie and that’s a really great costume! What a cute costume! He looks great! I love Jen Shragge’s description of what happened when her son’s Captain America’s custume arrived by mail at their house.That is exactly what any 6 year old would do if he is really into being a hero as most boys are. That should give Mom the satisfaction that she did, indeed, make the right decision by her son’s delighted reaction. Kudos to them both. I am beginning to believe, like Jen, that little boys are hardwired to be heroes. I found out recently that one of our little great grandsons, who is three, loves to dress up as a ‘hero’ and go around doing ‘great heroic deeds.’ I think it is wonderful that this is instinctive to them. It should be encouraged to have them behave like real heroes, i.e., real gentleman.